MIDWEEK MIXTAPE // Royal Wedding Special! Is there a marriage this week? Apparently it’s all over the papers. There’s bunting hanging limply from lampposts, a small cluster of morons wearing Union Jack jumpers (where do they buy those things?) are queuing outside Westminster Abbey already and God is getting ready to ruin the whole stupid thing by making it rain on Friday. 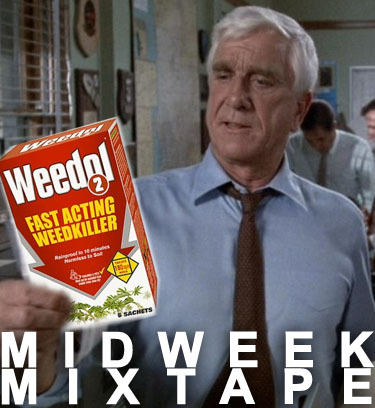 When Lt. Drebin heard about the forthcoming events he rushed out to buy supplies and is joining with a huge weeding of his own. I’m taking the only sensible precaution and am spending the whole week listening to great new music in an effort to avoid it all, so why not follow suit and initiate your Wills ‘n’ Kate-dodge with this Midweek Mixtape? FIRST! Aias‘s soft-as-snow, warm-as-fresh-candy-floss songs seem to bob along on a boiling sea of their own soft fuzz. Sung in Catalan, these simple, sweet nursery rhymes are about love, life and happiness. Or in the case of La Truita, trout. Delicious. SECOND! SP-33 has mixed the sounds of Lil Wayne and reconstructed them with samples from John Carpenter movies. This strikes me as a particularly 21st century bright idea. The resulting songs are sledgehammer-heavy and flooded with white light. Excellent. FOURTH! White Fence makes songs like Get That Heart that are so tissue-thin and delicate that they seem to be on the verge of collapse. Insistent, awake and simple, these are small songs to be treasured, like tiny jewels of sprightly pop. Posted on April 27, 2011 by Joe Sparrow. This entry was posted in Headline, Today's New Band. Bookmark the permalink. ← Float Riverer: To See Or Not To See?